Hello Katie Girl: Lights, Camera, Action! It's no secret that I have a lot of bags but one of my new favorite styles of bag is the camera bag. I know this style is very 80s inspired but it seems to be all the rage right now and I am definitely smitten with it! Originally, I was tempted to buy a Chanel or Gucci camera style bag but since I feel that this style might be more or less a trend, I've opted for some more budget friendly options like this red, white and blue one from Forever 21. At just under $20, it gives you a lot of bang for your buck and, to be honest, if you didn't actually feel it, it might easily be mistaken for a designer bag! I paired this fun camera style bag with a yellow floral cardigan and a striped skirt. It's a great outfit for transitioning into spring with a floral print. Also, I'm a big fan of the yellow and blue combination with some small pops of red. It's a great way to do primary colors without looking like you're a walking Mondrian painting! 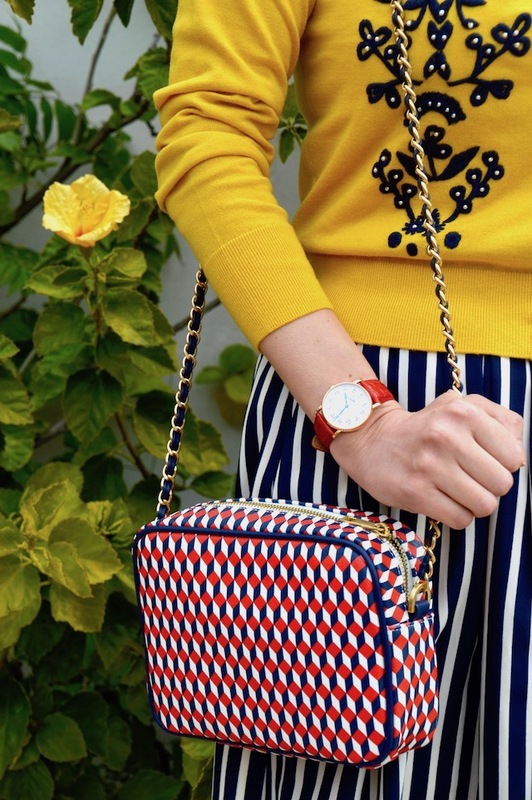 Certainly, this red, blue and yellow ensemble is ready for its close up! Great ensemble! Love the mix of patterns! Oh the purse is so fun and a definite throwback! Fabulous bag! It really does look a lot more expensive. 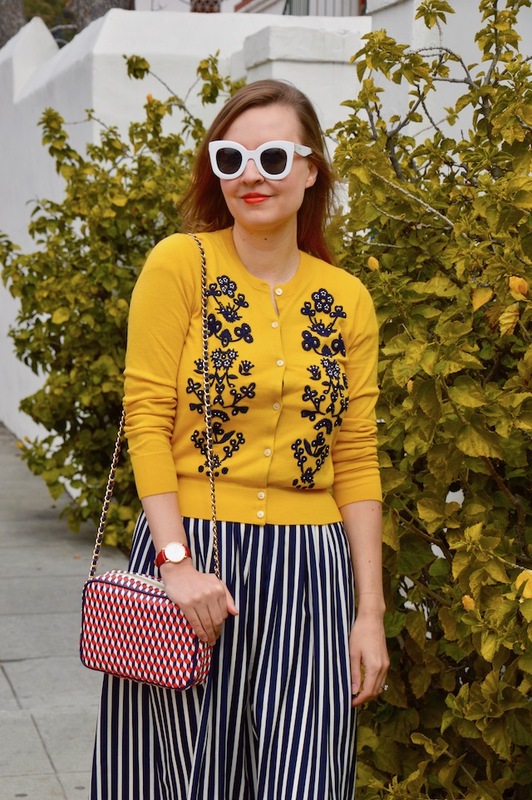 I love your cardigan, the contrast of the blue embroidery on the bright yellow is beautiful.It looks amazing with the striped skirt and red shoes! Thanks for linking up!